First , a desire to preserve the balance of Truth. In order to do this it is desirable that there should be an alternation between and a proportionate emphasis upon both the objective and the subjective sides of the Truth. After we had completed our exposition of the doctrine of Justification we followed the same with a series on the doctrine of Sanctification: the former treats entirely of the righteousness which Christ has wrought or procured for His people, being something wholly outside of themselves and independent of their own efforts; whereas the latter speaks not only of the perfect purity which the believer has in Christ, but also of the holiness which the Spirit actually communicates to the soul and which is influential on his conduct. Then we took up the doctrine of Predestination which is concerned entirely with the sovereignty of God, and therefore we followed that with a series of man's Impotency and the Saint's Perseverance, where the principal emphasis was upon human responsibility. It will be well for us now to turn our attention back again to the Divine operations and the wondrous provisions of Divine grace for the recovery of rebels against God. Second , because of a felt need of again bringing conspicuously before our readers "the cross of our Lord Jesus Christ." 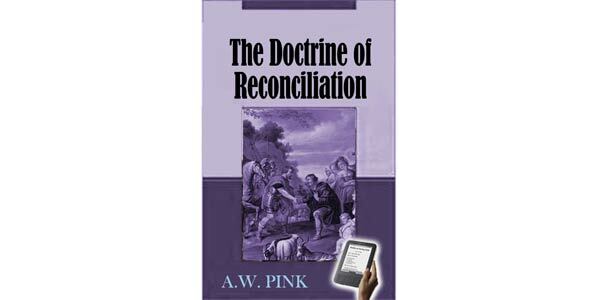 It is His sacrificial work which is prominent, yea, dominant in the reconciling of God to His people. It was by the shedding of Christ's precious blood that God was placated and His wrath averted. It was by Christ's being chastised that peace has been made for us. And it is by the preaching of the Cross that our awful enmity against God is slain and that we are moved to abandon our vile warfare against Him. As it is upwards of twelve years since we completed the rather lengthy series of articles we wrote upon the Atonement, under the title "The Satisfaction of Christ," it seems high time that we once more contemplated the greatest marvel and miracle of all history, namely, the Lamb of God being slain for the redemption of sinners. The doctrine of reconciliation has much to do with what took place at Calvary, yea apart from that no reconciliation with God had been possible. It is therefore a subject which should warm the hearts of the saints and bow them in adoration at the feet of the Redeemer. Third , because it treats of an aspect of the Gospel which receives scant attention in the modern pulpit. Nor has it ever, so far as we have been able to ascertain, been made very prominent. This doctrine has failed to command the notice which it merits even from God's own servants and people. Far less appears to have been preached on it than on either justification or sanctification. For one book written on this subject probably fifty have been published on either of the others. Why this should be is not easy to explain: it is not because it is more obscure or intricate. In our judgment, much to the contrary. Certainly it is of equal importance and value, for it treats of an aspect of our relationship and recovery to God as essential as either of the others. Our need of justification lies in our failure to keep the Law of God; of sanctification, because we are defiled and polluted by sin, and therefore unfit for the presence of the, Holy One; our reconciliation, because we are alienated from God, rebels against Him, with no heart for fellowship with Him. Though the terms justify and sanctify occur more frequently in the New Testament than does "reconcile," yet the correlative "God of peace" and other expressions must also be duly noted. Not only has this doctrine been more or less neglected, but it has been seriously perverted by some and considerably misunderstood by many others. Both Socinians (who repudiate the Tri-unity of the Godhead and the Atonement of Christ) and Arminians deny the twofoldness of reconciliation, declaring it to be only on one side. They insist that it is man who is alienated from God, and so in need of reconciliation, that God never entertained enmity toward His fallen creatures, but has ever sought their recovery. They argue that since it was man who made the breach by departing from his Maker, he is the one who needs to be reconciled and restored to Him. They refuse to allow that sin has produced any change in God's relationship or attitude unto the guilty, yea, so far from doing so that His own love moved Him to take the initiative and provide a Saviour for rebels, and that He now beseeches them to throw down the weapons of their opposition, assuring them of a Father's welcome when they return unto Him. Such is the view of the Plymouth Brethren. 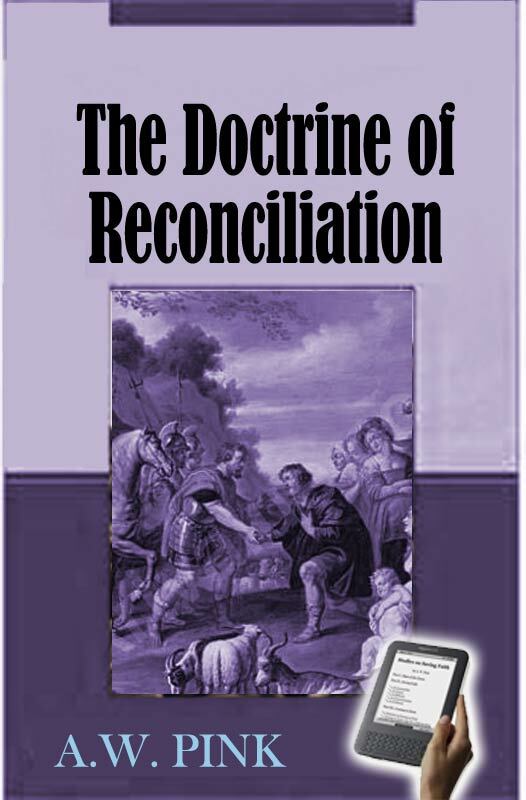 In his work "The Ministry of Reconciliation " C. H. Machintosh (one of the most influential of their early men) declares: "We often hear it said that 'the death of Christ was necessary in order to reconcile God to man.' This is a pious mistake, arising from inattention to the language of the Holy Spirit and indeed to the plain meaning of the word 'reconcile. ' God never changed, never stepped out of His normal and true position. He abides faithful. There was, and could be, no derangement, no confusion, no alienation, so far as He was concerned; and therefore there could be no need of reconciling Him to us. In fact it was exactly the contrary. Man had gone astray; he was the enemy, and needed to be reconciled...Wherefore, then, as might be expected, Scripture never speaks of reconciling God to man. There is no such expression to be found within the covers of the New Testament." This is something he calls a "point of immense importance," and consequently all who have succeeded him in that strange system have echoed his teaching: how far it is removed from the Truth will be shown in the articles that follow. Some hyper-Calvinists are also much confused on this doctrine. Through failing to see that God's being reconciled to sinners who believe concerns His official relationship and not His essential character, they have demurred at the expression "a reconciled God ," supposing it connotes some charge within Himself. They argue that since God has loved His elect with an everlasting love ( Jeremiah 31:3) and that since He changes not ( Malachi 3:6), it is wrong for us to suppose that reconciliation to anything more on our side only. They insist that to speak of God's being reconciled unto us implies an alteration either in His affections or purpose, and that neither of these can stand with His immutability. To speak of God's first loving His people, then hating then, and then again loving them, appears to them as imputing fickleness to Him. So it would be if these predictions of God were made of Him considered in the same character and relationship. But they are not. As their Father God has loved His people with an unalterable love, but as the Moral Governor of this world and the Judge of all the earth He has a legal enmity against those who trample His Law beneath their feet. The following question was submitted to Mr. J. C. Philpot:— "What is meant by 'a reconciled God,' an expression which some of the Lord's children, even great and good men, have made use of? I believe that the Lord Jehovah from all eternity foresaw the fall, and provided means to save those whom He had chosen in Christ, consistent with all His attributes, holiness, justice, etc. Now, as love was the moving cause, how can the word 'reconcile ' be correctly used in respect of God? Does it not imply a change? If it does, how can it be correctly used in reference to God?" His answer to this appears in the March 1856 issue of "The Gospel Standard ," and though it will make a rather lengthy quotation, yet we might be doing him an injustice not to give it in full. "We do not consider the expression 'A reconciled God ' strictly correct. The language of the New Testament is not that God is reconciled to us, but that we are reconciled to God. 'And all things are of God, who has reconciled us unto Himself by Jesus Christ, and has given to us the ministry of reconciliation— that God was in Christ reconciling the world to Himself, not imputing their trespasses to them; and that He has committed to us the word of reconciliation. Now we are ambassadors for Christ, as though God did beseech you by us. We beg you in Christ's stead, be reconciled to God.' ( 2 Corinthians 5:18-20). And again 'And, having made peace through the blood of His cross, it pleased the Father to reconcile all things by Him unto Himself—by Him, whether things in earth or things in Heaven. And you, who were once alienated and enemies in your mind by wicked works, yet now He has reconciled in the body of His flesh through death to present you holy and unblameable and unreprovable in His sight,' ( Colossians 1:20-22). See also Romans 5:10. "The very nature of God, His very being and essence, is to be unchanging and unchangeable, as James beautifully speaks: 'With Him there is no variableness , neither shadow of turning. ' But reconciliation on God's part to us, would seem to imply a change of mind, an alteration of purpose in Him, and is therefore, so far, inconsistent and incompatible with the unchangeableness of the Divine character. It is also, strictly speaking, inconsistent, as our correspondent observes, with the eternal love of God, and seems to represent the atonement as influencing His mind, and turning it from wrath to love, and from displeasure to mercy and grace. Now, the Scripture represents the gift of Christ, and consequently the sufferings and blood-shedding for which and unto which He was given, not, as the procuring cause, but as the gracious effect of the love of God. 'Herein is love, not that we loved God, but that He loved us, and sent His Son to be a propitiation for our sins' ( 1 John 4:10).